Home » Classes & Events » Are you Milk Maiden Material? Are you Milk Maiden Material? Dean Dairy Milk Maids 1959 Copy of black and white photo of young women dressed in milk maid costumes to celebrate Dean Dairy’s 75th anniversary in 1959. 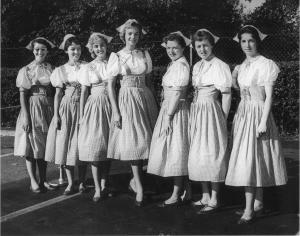 Seven women wear matching checked jumpers with white blouses and hats, along with buttons which read, “We’re celebrating Dean’s 75th Anniversary.” -Photo located at the Cleveland Heights Historical Center at Superior School House. Calling all Milk Maids (yes, men are welcome)! The 2015 Milking season has arrived. This is an Open Call for seasonal Milk Maidens in Training (as opposed to Ladies in Waiting…) for the 2015 milking season. We have a small herd of Nigerian Dwarf and Mini Nubian dairy goats. Milking season is ongoing and requires daily milking. The position is rarely open to the community and signups WILL GO QUICK. If you are interested, please contact us directly for the Milking Basics Class and Training schedule. One on One milking sessions are available year round with more or less emphasis on animal husbandry depending on the season. Milking Interns will be announced after training in early April. Milking Interns are eligible for continued positions with the farm. Please indicate your interest level at the time of inquiry CLASS ONLY/TRAINING/MILKING INTERN/MILK MAIDEN. Our bearded ladies (lady goats) respond to familiarity. The selected candidate(s) will become part of the extended farm family. There are opportunities to grow your responsibilities with the farm for the right person. Beginners are welcome!! Training provided. Inquire with info@wishwehadacres for further details. Sign ups are individual and ongoing at this time. CLASS ONLY (Watch milking demo and learn hand milking basics. Required for all milking positions. MILKING INTERN. Prerequisites: Milking Basics Class and One on One Training. Sign onto a volunteer seasonal milking position. MILK MAIDEN – Once Seasonal Training is complete, you are automatically registered with our farm as a Milk Maiden. 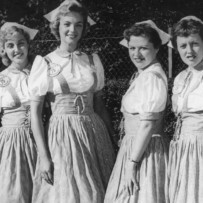 Milk Maidens are an extension of the farm. Earning opportunities available.